Authored by kossebau on Nov 8 2017, 12:37 AM. account visibility) and keeps further ones blank. LGTM. I assume the hover information stays the same? Thanks for first feedback. Still need to write some more detailed introduction notes, though, hopefully get to it tonight. My plan (and initial motivation for the delegate) though is to get the tooltip to show the complete commit message, not just the first line. Ideally even as active tooltip and with contained links or keywords available as active links. So the use-case of "hm, why was this change done, what has been discussed about it at the review" no longer needs thousands of UI interactions, but just a hover and clicking on the links in the tooltip. Still some way to go for this, but the delegate is a first step to that goal. Sadly the delegate needs to be done properly, due to the ABI needs in KTextEditor. But such is life. And as side-effect we already get some slightly more useful annotation sidebar, at least I already started to like the current UI proposal over the existing. Looks cool! The panel is extremely wide, maybe we want it to be a bit less wide ...? Re. KF5 version, please don't hard-bump the requirement ... requiring KTextEditor from tomorrow is really a burden. This feature isn't essential enough to make that necessary. All the windows builds will break, and it will be ages of work to get them properly updated to current KF5. Which width to use seems a challenge. No good idea yet, see first item in "Yet to be solved:" and the comments in VcsAnnotationItemDelegate::sizeHint(). So far my main testing use-case has been: understanding history of some code, and there the more I could see from the first line, the better, no need to go hunting for the tooltip. (And yes, I have a tiny laptop screen, 1366 px wide :) ). So goal of the width is: no need for tooltip, thus wide is better. 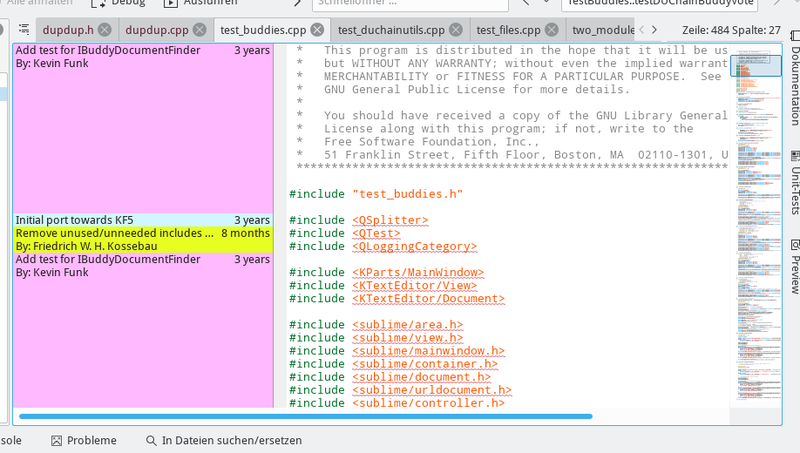 But if using the annotation bar together with tool views on both sides, too little source code text is seen (with my screen), so there it fails. Sometimes one might be only interested in the grouping of committed lines, where the content on the annotation bar is more used as id to see if the lines belong to the same. There a short width, with unique enough content would be sufficient. To be discussed. At least the delegate will allow to adjust to our needs, without having to go back to change KTextEditor API (ideally). Random thought, not sure if useful/technically feasible: the border could also behave like a splitter, allowing to resize it. Sounds useful to me, given the annotation content has no preknown sizes, so personal customization like in similar situations would be handy (I know I had the impulse to resize things a few times already). Should be implementable by adding the needed code to the KateView helper elements. Not on my personal TODO plan though. Still does not solve the challenge for a sane default width. But would at least allow to tune things to one's need (ideally the width being remembered per view, also across session reload). 40 characters or 25% of the view's width, whichever is smaller? Sorry Aleix, I'm strongly against this. Requiring KF5 5.40 effectively means nobody using ubuntu will be able to self-compile KDevelop easily before mid-next-year, it means we have to rebuild our windows dependency chain (which in the past always turned out to be at least a day's worth of fiddling), and so on. It's simply not worth it. Let's keep the ifdef and wait for more things depending on later KF5 to come up before we bump the requirement. @kossebau Why's that still commented? in this file. /me doesn't like #ifdefs, #ifs are easier to track since you're getting compiler warnings when the define gets lost for whatever reason. xD in fairness, v5.40.0 nowadays is older than the last Ubuntu LTS release and it should be fine to have it included there unconditionally. Oops, thanks for your new comments, developer mates :), but did not consider an update would trigger you to look at it again. This was not the intention, but to save the current state, while I give further work a try. re: version. The needed changes are not yet in KTextEditor, so any if version will be in some future KDE Frameworks one, 5.51 or later. So please give the Summary text a look and add some comments to those items, what you think can be done about them. of usage (as they would return false for now, being a future version). screenshot only tells so little. KTextEditor in October, once 5.51 is tagged. those people running master of KTextEditor and KDevelop. I like it so far. The additional information is certainly helpful when trying to understand the history of some piece of code. The behaviour of the ToolTip is better now. However, if the commit message is too short, it's sometimes not possible to reach "Select All" in the context menu of the ToolTip. But that's rather an issue with the ActiveToolTip vanishing immediatly once it's left. On a small screen, that's taking a little too much space in my opinion. I preferred 20%. What would be necessary to make it resizable? Yes, seen that as well. Not yet sure what to do here. Eek, I will have a look tomorrow, never experienced that. Myself I would actually prefer 30 % :) Guess that should be a value users want to customize in the general kdevelop settings. Will extend the patch to propose to add that. Thanks everyone for your comments and testing so far. To keep things moving and given no objections raised on the related KTextEditor patch D8708, I will now (unless finally objections are raised) push the KTextEditor patch once 5.51 has been tagged upcoming WE, so there are 4 weeks of testing for everyone running master, until the new KTextEditor API becomes published and final. And thus would do the same to this patch, push it to master. I would have liked to extend the patch before to add some config UI for allowing to control the percentage the annotation border takes from the view, given that people have already raised different opinions about what a proper value would be. Though I feel people might to actually first experience the look and feel of the new annotations, before they have an idea what proper config options would be, alternatively to a Percent Of View Width. So propose to do that as a separate work, and start with 25 % as hardcoded value.